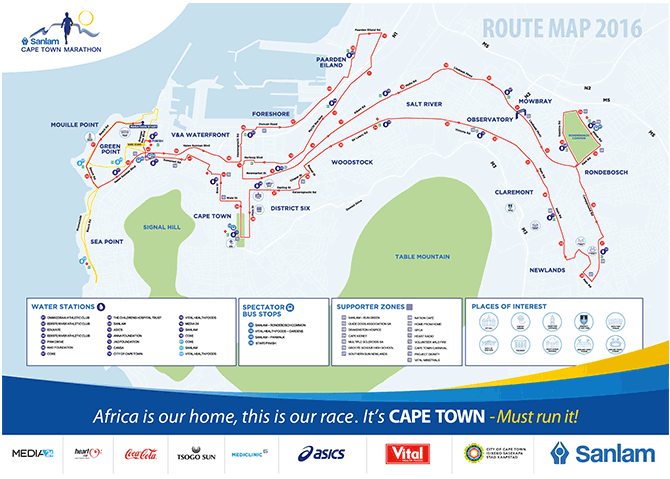 17-18 September 2016 is when the streets of Cape Town will be filled with runners joining in for the Sanlam Cape Town Marathon which is run over 2 days. The main event is the 42.2km Marathon on Sunday 18th September starting at 07:00 with 7000 athletes participating. See the interactive map for the full race details. The starting point is from Beach Road, corner of Granger Bay and Beach Road, Green Point, Cape Town with a cut off time of 7 hours. The event is IAAF Silver approved as a global race, with international runners taking part. Last year’s (2015) men’s race was won in 02:11:41 by Shadrack Kemboi from Kenya, with Isabella Ochichi from Kenya winning the women’s diversion in 02:30:20. Events on Saturday 17th September are the Peace trail 22km or 11km on, Starting 07:00 from Green Point A Track, Green Point with 500 trail runners hitting the trails of Signal Hill and Lion’s Head in a cut off time of 4.5hours. You will enjoy stunning city and iconic Table Mountain vistas from the slopes of Signal Hill, as well as breath taking views over the sweeping Atlantic Ocean from the contour path on Lion’s Head before making the descent to finish at Green Point Stadium. The 12km starts after the 22 at 07:45 running the similar route but shorter. Then at 12:00 to make sure no families are missed out on the action, there will be high-spirited 4.2km Fun Run is a community-building event that opens the race track to all. It’s the opportunity for families and friends; business, school and other community groups to band together and enjoy being part of one of Africa’s most prestigious athletic events. The flat route circles the attractive green space of the Green Point Urban Park and Biodiversity Garden. The one-hour cut-off time to accommodate walkers.